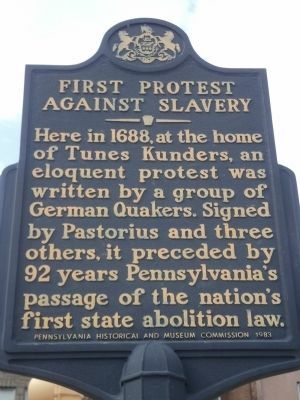 Here in 1688, at the home of Tunes Kunders, an eloquent protest was written by a group of German Quakers. Signed by Pastorius and three others, it preceded by 92 years Pennsylvania’s passage of the nation’s first abolition law. Erected 1983 by Pennsylvania Historical and museum Commission. Location. 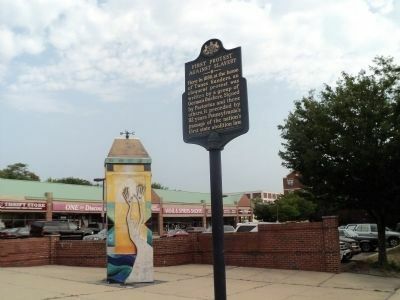 40° 1.802′ N, 75° 9.899′ W. Marker is in Philadelphia, Pennsylvania, in Philadelphia County. 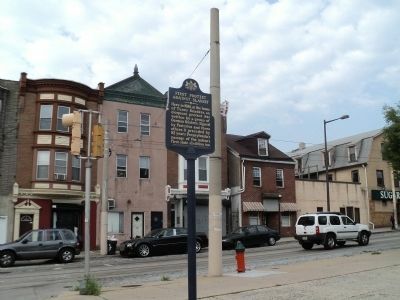 Marker is at the intersection of Germantown Avenue and E Wister Street, on the right when traveling north on Germantown Avenue. Touch for map. Marker is at or near this postal address: 5109 Germantown Ave., Philadelphia PA 19144, United States of America. Touch for directions. In the 17th century, the Germantown Society of Friends held their first meetings in a house located on this site. Here Francis Daniel Pastorius, a leader of the Germantown settlement, wrote the protest against slavery. This was the first step that led to the eventual abolition of slavery. (approx. 0.4 miles away); The Germantown White House (approx. half a mile away); a different marker also named The Germantown White House (approx. half a mile away). Touch for a list and map of all markers in Philadelphia. More. Search the internet for First Protest against Slavery. Credits. This page was last revised on June 16, 2016. This page originally submitted on September 3, 2011, by Bill Coughlin of North Arlington, New Jersey. This page has been viewed 623 times since then and 12 times this year. Photos: 1, 2, 3. submitted on September 3, 2011, by Bill Coughlin of North Arlington, New Jersey.